Reagan’s desire to demonstrate U.S. readiness to use military force abroad sometimes had tragic consequences. In 1983, he sent soldiers to Lebanon as part of a multinational force trying to restore order following an Israeli invasion the year before. On October 23, more than two hundred troops were killed in a barracks bombing in Beirut carried out by Iranian-trained militants known as Hezbollah. In February 1984, Reagan announced that, given intensified fighting, U.S. troops were being withdrawn. Anticipating his reelection campaign in 1984, Reagan began to moderate his position toward the Soviet Union, largely at the initiative of his new counterpart, Mikhail Gorbachev. The new and comparatively young Soviet premier did not want to commit additional funds for another arms race, especially since the war in Afghanistan against mujahedeen—Islamic guerilla fighters—had depleted the Soviet Union’s resources severely since its invasion of the central Asian nation in 1979. Gorbachev recognized that economic despair at home could easily result in larger political upheavals like those in neighboring Poland, where the Solidarity movement had taken hold. He withdrew troops from Afghanistan, introduced political reforms and new civil liberties at home—known as perestroika and glasnost—and proposed arms reduction talks with the United States. In 1985, Gorbachev and Reagan met in Geneva to reduce armaments and shrink their respective military budgets. The following year, meeting in Reykjavík, Iceland, they surprised the world by announcing that they would try to eliminate nuclear weapons by 1996. 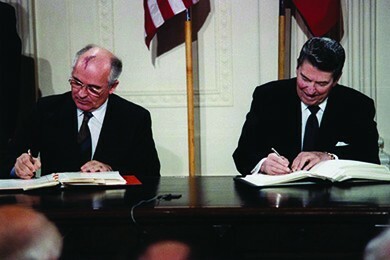 In 1987, they agreed to eliminate a whole category of nuclear weapons when they signed the Intermediate-Range Nuclear Forces (INF) Treaty at the White House. This laid the foundation for future agreements limiting nuclear weapons. In response to the invasion, Bush and his foreign policy team forged an unprecedented international coalition of thirty-four countries, including many members of NATO (North Atlantic Treaty Organization) and the Middle Eastern countries of Saudi Arabia, Syria, and Egypt, to oppose Iraqi aggression. Bush hoped that this coalition would herald the beginning of a “new world order” in which the nations of the world would work together to deter belligerence. A deadline was set for Iraq to withdraw from Kuwait by January 15, or face serious consequences. Wary of not having sufficient domestic support for combat, Bush first deployed troops to the area to build up forces in the region and defend Saudi Arabia via Operation Desert Shield. 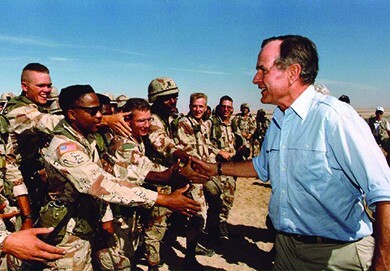 On January 14, Bush succeeded in getting resolutions from Congress authorizing the use of military force against Iraq, and the U.S. then orchestrated an effective air campaign, followed by Operation Desert Storm, a one-hundred-hour land war involving over 500,000 U.S. troops and another 200,000 from twenty-seven other countries, which expelled Iraqi forces from Kuwait by the end of February.